The Inside is merely the fold of the outside, as if the ship were a folding of the sea. Editorial house of Norrskensflamman. Photographer: Unknown. Source: City archive of Luleå. The facilities of Norrskensflamman. The slow press. Photographer: Gustaf Holmström, 1936. Source: City archive of Luleå. 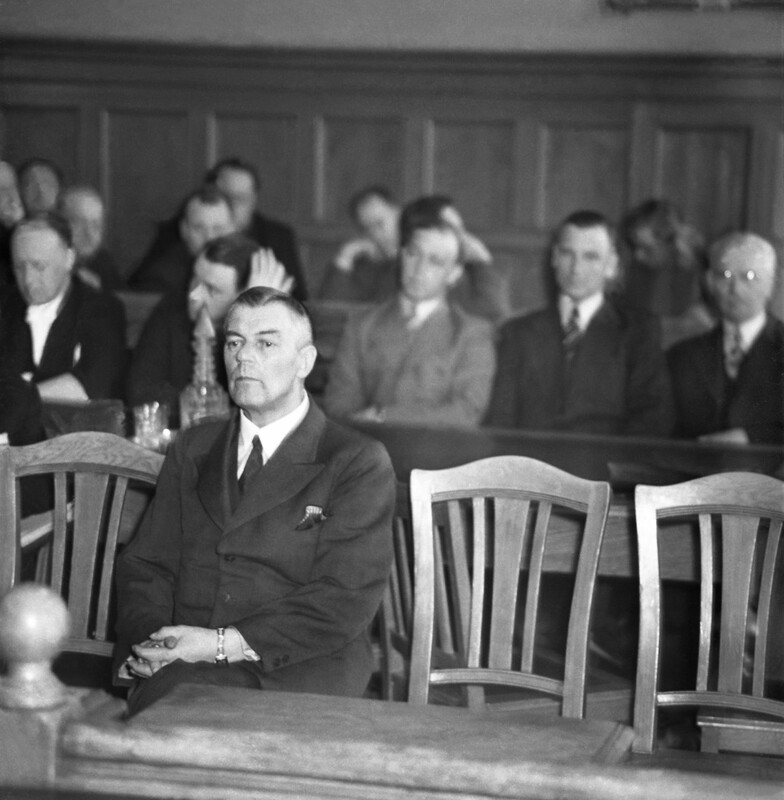 The trial after the attack on Norrskensflamman April 27, 1940. Photographer: Gustaf Holmström, 1940. Source: City archive of Luleå. The night of March 3, 1940, a fire was ignited. The burning house was a large, white wooden house of the kind still typical of Luleå. It housed ten people – men, women and children - as well as the offices of a newspaper, its printing press, and the rooms of the communist party. But this was no ordinary fire. It began with a powerful explosion and immediately after, the house was ablaze. At the last moment, the five people living on the top floor, two men, one woman and her two boys, managed to escape the fire by tying together sheets. The remaining five fell victim to the fire. The Hellberg family - husband, wife and daughter Maj, eight years - were gone. Gone were also Ms. Grandberg and Torgny Granberg, 12 years old. The fire at Kungsgatan 27 casts its flare all over Norrbotten and across the country. It shimmers in the faces of many people. – I had been out on that Sunday morning, and when I came home I met a friend on the farm, his name was Henrik Strand. – Norrskensflamman burnt down, he said. And Arthur Hellberg died in the fire. – No, do not say that, said the old man. You should not say such things. – It was as if the people were paralysed by the fact that something so incredibly cruel and horrible could happen. – It was such a repulsive thing. I remember going to the shop, and meeting someone who was laughing. – How can you laugh at something like that! I said. – It was only a joke, he insisted. – Yes, I said, keep those jokes to yourself. This is human life we are talking about! It is human life that has gone to waste! In such a situation, how can you wear a smile on your lips? Faces were abound on the morning of the fire, the 3rd of March. But one face draws more attention to itself than others. That of the town’s chief of police, Hallberg, ridden by drinking and a lack of sleep, appears at the scene of the fire for the first time at ten to four. It's just before the house collapses. The chief of police shows himself several times at the scene. He instructs the policemen doing the clearing work. He is there when the corpses, frightfully disfigured, "light like straw dolls", are taken out of the ruins and photographed, he is there carrying and lifting them onto the truck that would drive them to the mortuary, he has even arranged for the car and the driver himself. He snooped around the fire detectives from the forensic team, since, to his great dismay, he was not allowed a hand in the investigation. He leaves his own memorandum for the fire investigation of media coverage from the great communist raid in early February, in which Norrskensflamman’s printing company is said to be highly flammable due to neglect. He even calls on the dead Hellberg to make these statements seem credible. He is working – with one and a half months of freedom still left for him. He seizes the communist newspapers, he places communists under arrest. He continues to assist the Finnish Committee in controlling the volunteers. He continues to intern “unreliables” in the labour camp at Storsien. He is a man who carries on as if nothing happened - and he always has been. He is powerful: police chief, public prosecutor, and chief in the air defense. Now, regarding the war in Finland and the threat from the east, he has been given the mandate of General Douglas in the Army Staff to survey and control the communists. The chief of police Ebbe Hallberg: The embodiment of law and order in the town. And - one of the men behind the fire. On the 13th of April, he was suspended from his duties. On the 19th, he was arrested as one of the suspects for the attack on Norskskensflamman. In court, in the unfamiliar role of the defendant - he had over the years grown used to appear at the bar as a prosecutor - this man had made one persistent statement: "Everything is a lie, from beginning to end." He was declared insane after examination. The madness was believed to have started in 1934. He was convicted of service negligence and embezzlement, of, among other things, a stock of confiscated spirits, to 1 ½ years of hard labour. But death interrupted. On the 6th of March, 1941, one month after the sentence in Luleå, one year after the attack, he died at Långholmen Prison’s hospital ward. The flare of the fire shimmers in many faces. The blaze also throws its flames up the river, towards the nearby Boden, the military town, where the cannons point east in anticipation of a full-on war psychosis. There, a white-painted military car has just driven between the gate posts to commandment C and parked below the yellow facade, where a single window is lit. The car took the road that runs along the southern riverbank, the road from Piteå, to avoid one of the barriers at Luleå, and to be able to appear to have come to Piteå, if the booth is also blocked. Inside the apartment a captain of the army staff, 44 years old, aide to General Reuterswärd and chief of military security service. Five men have traveled in the white-painted military car. Now they are under the chandelier in the captain's living room drinking champagne. In addition to the captain, there is a journalist at Norrbottens Kuriren, 30 years old, three sublieutenants of the engineer troops, all 24 years old, and a 28-year-old drafted recruit. One of the sub-lieutenants [continues on the next page] and the recruit comes from Kemi and the war in Finland, where they have volunteered. They will also return there on Monday. They enjoy the champagne, and the captain also offers sandwiches and spirits. They didn’t stay in order to await the outcome of their mission, they later stated before the court. “We didn’t know until Sunday morning," writes one of the sub-lieutenants in a letter to his father. They never confessed to arson in the court, they were never convicted of manslaughter, not even in the court of appeals, where the punishment was increased from no more than two years, to seven years of hard labour. "There must have been a parallel attack," said the state lieutenant on the 11th of March, 1940, in the town hall court, at the second trial in Luleå. What did they show? What remains is that they were drinking champagne while the house burned down and the fire turned everything flammable into ashes. One thing shimmers in their faces: the war in Finland. "We in the focal point of events had reason to believe the outbreak of war was immediately immanent on the eastern border of our country,” the journalist later wrote to the Supreme Court. "We soldiers who had been tasked with defending the country against the outer enemy had difficulty telling the difference between this enemy and the communists in the Norrskensflammans printing press, whose anti patriotic writings we considered to have paved the way to the outer enemy", writes the captain in 1943 in a plea for clemency to the assembly government. Many of Luleå's beautiful wooden houses would probably have been on fire if the generals had their way, that is, if the coup had been successful and the forces given orders to march eastward (“Plan Gustav”, named after the crown prince Gustav Adolf). "Everyone was eager to face our presumed, historical enemy, at all costs, even though he sought to undermine the nation's defence through illegal propaganda within its borders," the captain further writes in his plea. But no clemency was granted, neither to him nor any of his five companions. 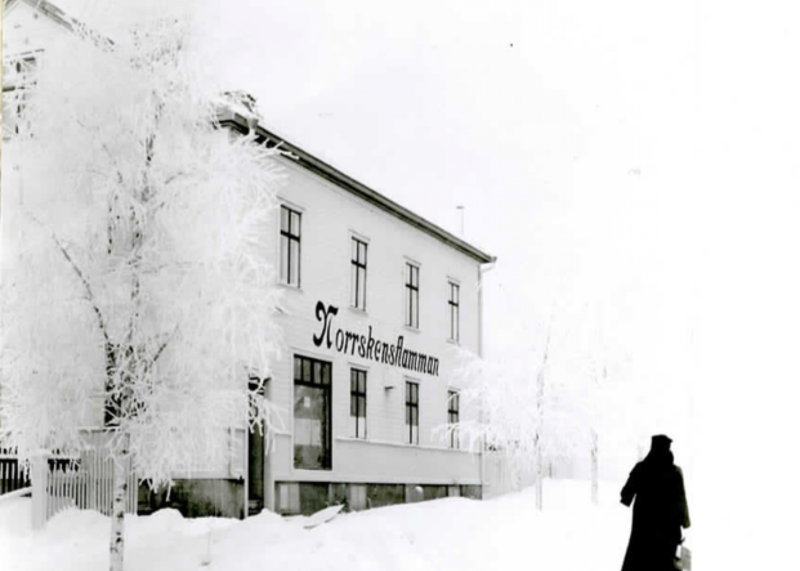 While the darkness fell on the scene of the fire, the board of the newspaper gathers in the community centre on Skeppsbrogatan to work on a stencil: Norrskensflamman, 4th of March, 1940, No. 53, 36th year. The organ of Sweden's Communist Party. Proletarians in all countries unite! The at that time perhaps most read issue of Norrskensflamman was made on a stencil cutting machine from Arvidsjaur. Norrskensflamman’s voice cannot be silenced, Norrskensflamman lives on! – Well! Now they burnt down Norrskensflamman. So now we’ll be free of that! From then on, Flamman was printed at Ny Dag [New Day] in Stockholm. The decision to introduce a transport ban had just been made by the parliament when the "patriots" attacked the newspaper and would be implemented from March 27th. 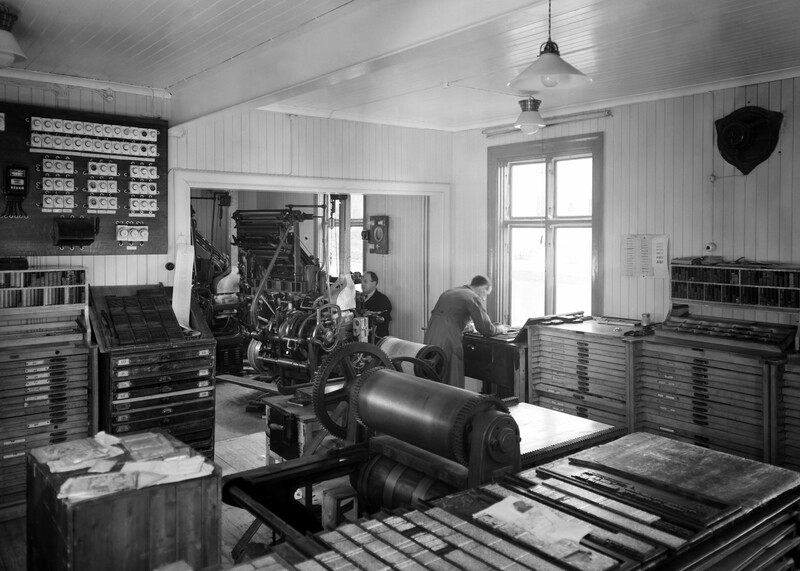 At the end of July, by their own effort, a new press was established in the house at Björngatan, where the newspaper still resides today, very close to the old address. On June 15, 1941, a memorial to the five who died in the fire was inaugurated at the cemetery in Luleå. Filip Forsberg spoke. On the large stone to this day you can read the last lines of Ragnar Jändel's poem Danko, named after a character in the work of Maxim Gorky, whose heart caught fire and lit the people’s way through the dark. A week later, the Germans attacked the Soviet Union. A new position was established - the covenant was broken, Stalin's Soviet would join the bourgeois democracies in the fight against fascism. But by that time, the attack on the Norrskensflamman had already drowned in the many events of the war. It sunk during this time of death and destruction, and there it lay, debris from a fire, combusting through the years like mouldy wood logs. It was intentionally repressed and became one of those hidden stories, swiftly buried by bourgeois society outside its cemetery, but which, when taken back up one day, will reignite and shine its revelatory light far and wide. The sentiment around the question of Finland in Sweden in the winter of 1940 may seem unlikely to those who did not agree with them. Those who volunteered in the Spanish Civil War had gone to Spain illegally; they had to sneak across the borders. But the volunteers going to Finland were supported by the whole establishment. The head of the Swedish forces in Norrbotten, Archibald Douglas, had prepared a plan for a Swedish intervention. Police officers propagated openly to their troops and urged them to cross the border to the enemy in the east. Writers traveled around to recruit volunteers. The collection of government credits and war material reached a value of up to SEK 500 million. Antagonism against those who refused to agree with the Finnish Commission's parole "Finland's cause is ours” was immense. There was much discussion about how to oppress the communists and their peace propaganda. At all costs, Norrskensflamman, Norrbotten’s communist newspaper, should be silenced. It was discussed to acquire the press for military purposes, to stop the paper deliveries; some of the staff were put in work camps and the rightwing newspaper Norrbottens-Kuriren began to suggest that the best way would be to "incapacitate the northern communist leaders". The men convicted of the attack - captain Svanbom, lieutenants Nordström, Krendel and Borgström, Luleå’s chief of police Hallberg, the journalist Hedenström and Palmqvist - were no lone fanatics. They had frequent contact with General Douglas' staff and received money from the Finnish Committee on several occasions. They were just the tools. The penalties for the crimes were extremely mild, to say the least. The attackers were never convicted of arson-murder. Instead, they presented the unreasonable theory that the explosion of the press and the fatal fire were caused by different people – the so-called "parallel attack”. And maintain the North, valley by valley. Harry Martinsson was one of the many who supported “Finland’s cause". Together with Eyvind Johnson, he traveled around Norrbotten, held meetings among the recruits and enlisted volunteers. The poem was in the Volunteer Union's own newspaper. Ulf Oldberg (1939~2017) was an author and teacher living in Malmberget when he wrote the documentary novel The attack on Norrskensflamman (1972). A close collaboration with artist Birger Jonasson resulted in two collections of poems, Gruvdikter [Mine Poems] (1974) and Dikter från Malmberget [Poems from Malmberget] (1978). He also published a number of other novels and a poetry collection. From 1976 Ulf Oldberg lived and worked in Haninge, south of Stockholm.